There are to major suppliers of traction to the american railroads: General Motors Electro Motive Division (EMD) and General Electric (GE). 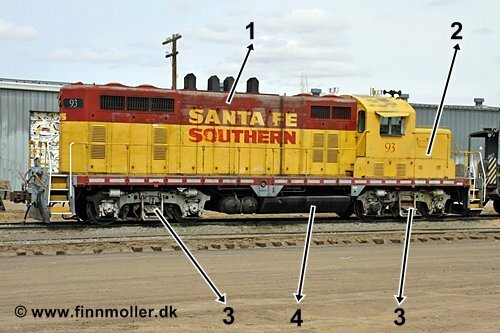 Below is a guide to identify the different american locomotives. But first a little about how builders and railroads designate locomotives as this sometimes can be a little confusing. 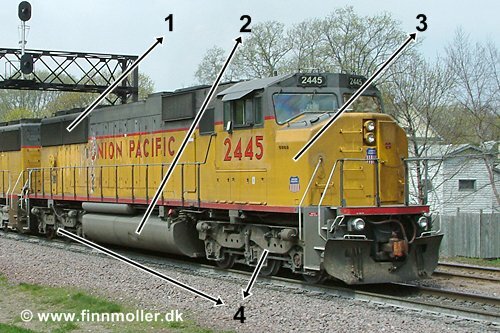 EMD: EMD 4 axle locomotives are called GP (General Purpose), EMD 6 axle locomotives are called SD (Special Duty). 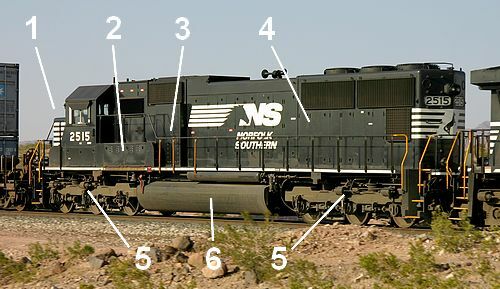 The number that follows do not indicate the power of the locomotive, but the higher the number, the newer and more powerful is the locomotive as a basic rule. The suffix behind the number has the following meaning: AC = AC traction, M = Safety Cab, T = Tunnel motor. 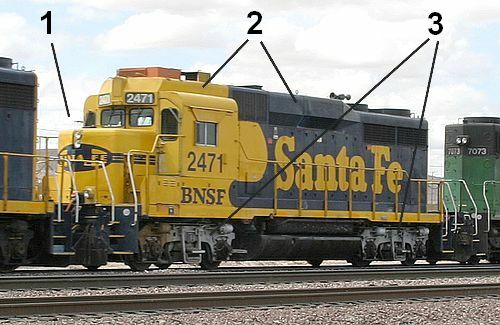 GE: "B" indicates a 4 axle locomotive, "C" indicates a 6 axle locomotive. The number is the number of horsepower divided by 100 (so 44 is a 4400 horsepower locomotive). The number after the dash gives som kind of indication of how old the model is - but the newest locomotives doesn't follow this rule. A "W" means widecab or safety cab. Besides, the railroads sometimes use another classification. Another way to find the model if you have the railroad and the locomotive number is to use a roster like The Diesel Shop. The Dash 8 can be found with both the traditionel cab and the new safety cab, and also with two power outputs (C40 = 4000 hp, C41 = 4100 hp). Here is the GE Dash 8-40C with traditional cab. 1. "Wingshaped" cooling air intakes. 3. Trucks - not the new high adhesion type. Look at the rear truck, for some reason, this particular locomotive have a different front truck. 4. GE characteristic angular fuel tanks. GE Dash 8-40C was built in the late 1980's and was sold in larger number to Union Pacific, Chicago & North Western and Norfolk Southern. A total of 585 was build. The Dash 8 can be found with both the traditionel cab and the new safety cab, and also with two power outputs (C40 = 4000 hp, C41 = 4100 hp). Here is a GE Dash 8-41CW with wide/safety cab. Note that the newest Dash 8 are very similar to the Dash 9 - but look at the trucks, the Dash 9 has high adhesion trucks. 2. GE wide or safety cab. 3. Trucks - not the new high adhesion type. GE Dash 8-40CW was built from 1990 to 1994 in a total of 900 and delivered to ATSF, Conrail, CSX, LMSX and Union Pacific. 2. High adhesion truck - these are found on DASH 9, AC4400 and AC6000. 4. GE characteristic angular fuel tanks - on the right side is two air tanks for the braking system. Data: wheel arrangement C-C, 3200 kW / 4400 hp, 16 cylinder engine, weight 185 t, tractive effort (start/cont.) 64 t/48 t, speed 73 mph / 117 kmh. GE C44-9W was built from 1993. 2. 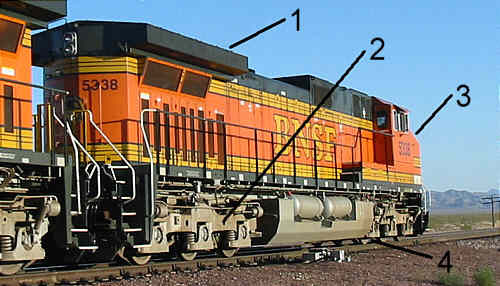 Large AC equipment box on the left side of the locomotive - the GE C44-9W has a smaller equipment box, also on the left side. 3. "Wingshaped" cooling air intakes. 5. GE characteristic angular fuel tanks. GE AC4400 is very similar to the GE C44-9W - the main difference is that the GE C44-9W uses DC technology, and the GE AC4400 uses AC technology. 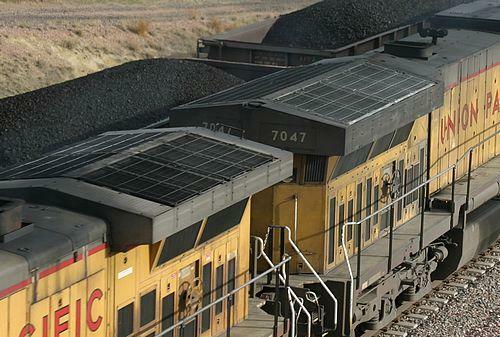 This makes the AC4400 more suitable for slow and heavy trains, especially coal trains. The AC4400 is quite popular with 2598 built - about half of these belong to Union Pacific, the rest belong to other railroads, especially Canadian Pacific and CSX. The AC4400 is no longer produced, it has been replaced by the GE ES44AC. 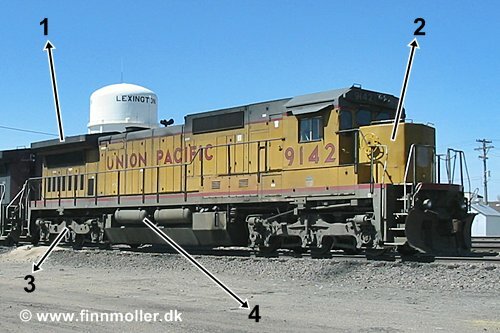 The way to tell an AC4400 from a C44-9W is by the AC4400's large box on the left side of the locomotive. 1. Cooling air intakes are larger than on C44-9W and AC4400. 2. Large equipment box on the left side (also found on the AC4400). The AC6000 is a very long locomotive, but else quite similar to DASH 9 and AC4400 in appearence. But the extra large "wings" and the position of the air tanks on the right side, and a large AC equipment box on the left side reveals a AC6000. 1. Extra large cooling air intake "wings"
2. The position of the air tanks. 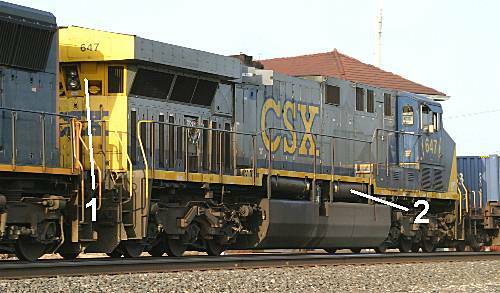 I have found that UP and CSX seems to have different trucks on their AC6000's, so this isn't a unique feature. Air intakes on a GE AC4400 CW (front) versus a GE C44/60CW (back, very much identical to AC6000) - the difference is noticeable. P42DC is used for passenger trains. 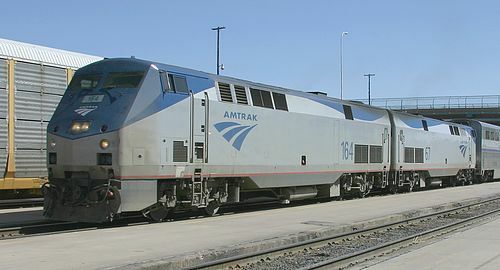 Most are owned by Amtrak, but also a few local companies use this locomotive. A P42 looks completely different from most other american locomotives. The most significant design features must be 1) no nose and 2) a very "boxy" design. 1. Cooling air intakes covered with "chicken wire". 2. Dynamic brake air intake. 3. Cab with rounded roof. 5. EMDs traditional, rounded fueltanks, on this model also notice air pressure tanks. Data: wheel arrangement B-B, 1100 kW / 1500 hp, 16 cylinder engine, tractive effort (start/cont.) - t/18 t, speed 65 mph / 105 kmh. EMD GP9 is a 4-axle General Purpose locomotive, a little more than 4000 were built between 1954 and 1963. The engine is a 16 cylinder EMD 567C. This model can sometimes be seen, typical in use at corporations like Cargill. 1. The usual dynamic brakes air intakes are missing. 4. EMDs traditional, rounded fueltanks. In the late 1970s Seaboard Coast Line rebuild 155 EMD GP7s, GP9s and GP18s, the rebuild locomotives were called EMD GP16. The original 567 engine was replaced with the newer 645 engine in a 1600 hp version - giving the "16" designation. 2. Roof design - this is not found on any other EMD. 2. EMDs traditional, rounded fueltanks. 3. Thin frame above air reservoirs/fuel tanks. 4. A relatively "clean" appearance. A blower-duct on the left side. Data: wheel arrangement B-B, 1840 kW / 2500 hp, 16 cylinder engine, tractive effort (start/cont.) - t/23 t, speed 65 mph / 105 kmh. EMD GP35 is a 4-axle General Purpose locomotive, a little more than 1300 were built between 1963 and 1966. The engine is a version of the wellknown 567, a 16 cylinder EMD 567D3A. Many of these locomotives are now gone, but you can still find some in active duty. 1. Traditional cab and nose. 4. 3 radiator cooling fans. 5. Long front and rear platforms. The last wheel is completely out from the hood. Data: wheel arrangement C-C, 2200 kW / 3000 hp, 16 cylinder engine, weight 170 t, tractive effort (start/cont.) - t/37 t, speed 65 mph / 105 kmh. EMD SD40-2 was built from 1972 until 1986 in a total of almost 4000 and became the standard american locomotive of the 1970's and 1980's. The SD40-2 was developed from the SD40, the most visible difference is probably bigger platforms on the SD40-2. The motor is an EMD 16-645-E3. The T-model is a speciel version of the SD40 designed for operation in long tunnels (T = tunnel). 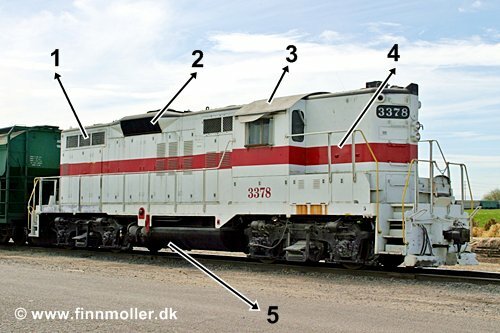 The air intake is placed lower than the normal SD40. 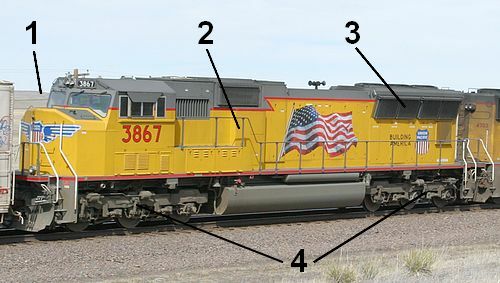 As the warm exhaust gasses is exhausted at the top of the locomotives, a high placed air intake is more likely to cause the engine to overheat. Therefore the T-model has lower placed air intakes. 2. EMD rounded fuel tanks. 3. Low placed cooling air intakes - this is only found on SD40T-2 and SD45T-2. EMD GP60B is uniqie in not having a cab, this makes it easy to recognize. 2. Traditionel walkway on both sides. Data: wheel arrangement B-B, 2800 kW / 3800 hp, 16 cylinder engine, veight 124 t, tractive effort (start/cont.) - t/28 t.
A total of 23 GP60B was built in 1991, all 23 was delivered to ATSF. 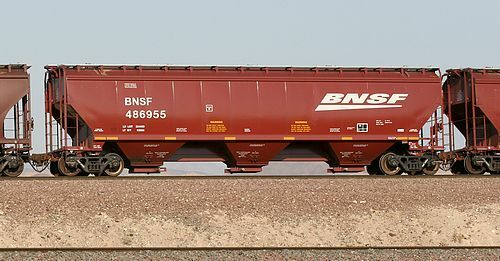 They are a little rare, but can still from time to time be seen on BNSF trains, primarily on local freights. The idea behind a cabless locomotive is to reduce costs (about 15%) - the disadvantage is lesser flexibility, as a cabless unit can't be used alone or as a leading unit. With the american tradition of using 2-4 locomotives on a train the idea of using cabless seems very logical, but for some reason such locomotives have never been a big success, as only 23 were built. EMD SD60 has a traditional cab. More "clean" appearance than a SD40-2 and GE's. 1. 3 radiator cooling fans. 4. Location of central air intake, dynamic brake intake and rounded blower duct on the left side. EMD SD60M has a safety cab and a relative clean appearance. 1. No wingformed air intakes. 3. Safety cab - some older models have a 3 piece wind screen, newer models have a 2 piece windscreen. 4. 3 axle trucks of older design. EMDs SD70 has only been bought by Norfolk Southern and Illinois Central. It's basically a SD70M with a traditionel cab. 2. Box on the left side just after the cab. 3. Blower duct with a different appearence than on SD60. 5. 3 axle trucks of a more modern design than SD60. 1. Modern wide-cab with two-piece windshield. 2. No blower duct on the left side. 3. 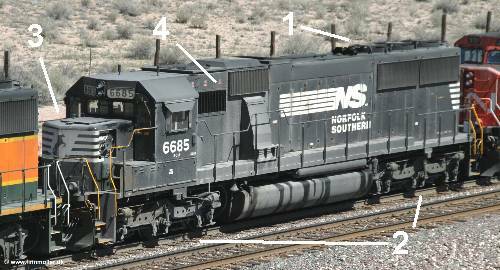 Notice the cooling air intakes, on some SD70M's they are slighly slanted (like this on), on others they are not. EMD SD70MAC is an AC-version of SD70M. 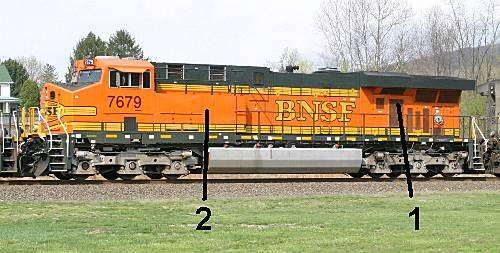 BNSF has almost 800 of these locomotives for use on heavy coal trains. 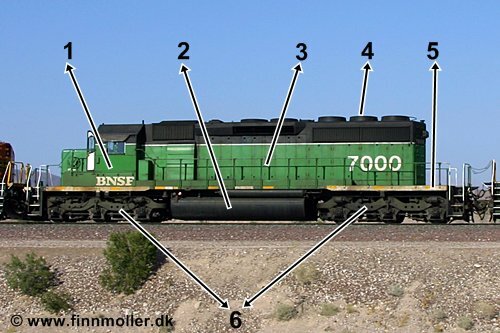 The SD70MAC is very similar to the SD70M, but notice 3) and 4), they can tell a MAC from a normal SD70M. 3. Extra air intake on each side for the inverters. 4. Rounded blower duct on the left side. One of EMDs newest locomotives with a very "boxy" design. This locomotive in many ways look more like a GE than an EMD (nose and fueltanks). 2. Angular fueltanks like GE locomotives. 4. Large cooling air intakes, like EMD SD90MAC/SD9043MAC. 5. Large equipment box on left side. 1. Wide cab EMD style - the shown model is a SD90MAC-H - the SD90MAC-H II have a different cab (like the SD70M-2 and SD70ACe). 2. Roof detail - different on EMD SD9043MAC. 3. Large cooling air intakes. 4. Modern 3 axle trucks. 5. The characteristic rounded EMD fuel tanks. 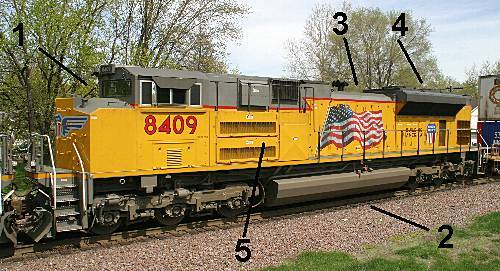 In the high power race in the 1990's, both EMD and GE introduced 6000 horsepower diesel locomotives and the SD90MAC was EMDs version of a 6000 horsepower locomotive, introduced in 1996. 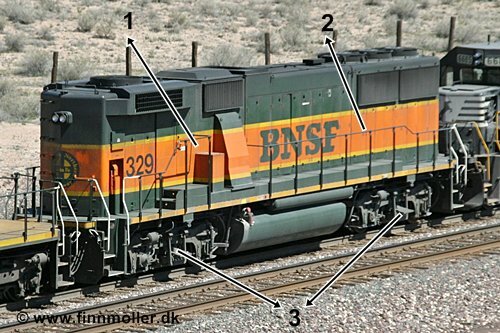 The SD90MAC have a 16 cylinder H-engine. Union Pacific was the only railroad to buy a larger number of these locomotives. But the H-engine was not reliable and the use of 6000 horsepower locomotives didn't have the same flexibility as less powerfull engines (a locomotive failure on a train hauled by 2 6000 horsepower locomotives will have higher impact than a failure if the train was hauled by 3 4000 horsepower locomotives). Today, all Union Pacifics SD90MAC are either scrapped or sold to leasing companies. The SD90MAC is a relatively rare locomotive today. 1. Wide cab EMD style. 2. Roof detail - different from the EMD SD90MAC. EMD SD9043MAC is basically a SD90MAC-H with EMD's 710 engine with "only" 4300 horsepower. Because of problems with the H-engine used in the SD90MAC, the first locomotives was delivered with the older and reliable 710-engine, and named 9043. The SD9043MAC locomotives is designed so that they later could be re-engined with the H-engine. But time has shown that the SD90MAC was not to successful, and none or very few SD9043MAC have been upgraded with the H-engine. 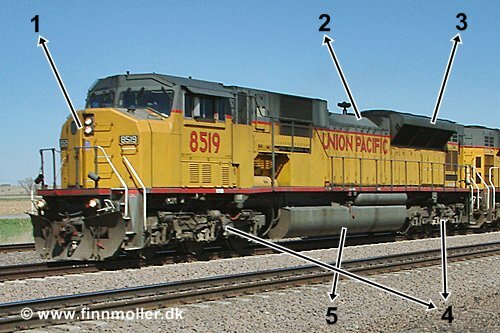 The more reliable 710-engine, and the higher flexibility in less powerful locomotives, have made the SD9043MAC relatively successful with more than 400 units built, most of the in service at Union Pacific, especially for hauling coal trains, but also Canadian Pacific and CEFX has the SD9043MAC in larger numbers. Above is data for different locomotives. Let's use these data. Basic physics says that power = force X speed. For a locomotive force is the tractive effort. A modern locomotive has for example 4400 hp ~ 3200 kW. If we put this power into the equation we get: 3200 kW = force X speed. With a speed of 50 km/h (= 31 mph = 13.9 m/s) we get force (tractive effort) = 3200 kW / 13.9 m/s = 230 kN ~ 23 ton. Higher speed means lower tractive effort. And lower speed means higher traction effort - until the maximal friction limit between wheel and rail is reached. 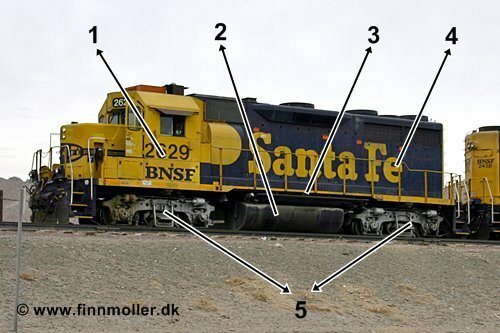 For a typical locomotive the friction coefficient is about 0.3 - this means the tractive effort of a locomotive weighing 180 ton can't exceed 0.3 X 180 ton = 48 ton ~ 480 kN. In the diagram on the right is the schematic relation between speed and tractive effort for a typical (fictive) locomotive. An example: a 5000 ton train including locomotives is travelling over Goffs Hill in the Mojave Desert, California. Needles (altitude 160 m) is about 45 km from the summit (altitude 792 m). This gives a grade of 1.4% - this isn't extreme, but a very normal grade. This also means that trains don't need extra locomotives (helpers) as in for example the Tehachapi Mountains. To haul a train up this 1.4% grade the locomotives must produce a force or tractive effort of 1.4 of 5000 ton = 0.014 X 5000 ton = 70 ton = 700 KN. A typical train on Goffs Hills is hauled by 3 modern GE C44-9W's. This gives a total effect of 3 X 3200 kW = 9600 kW. If we put this and the needed tractive effort of 700 kN into the equation power = force X speed => speed = power / force, we get speed = 9600 kW / 700 kN = 13.7 m/s = 49 km/h = 31 mph. In the "old days" all diesel-electric locomotives were DC (= the current to the traction motors were DC), but in later years locomotives with AC traction motors have become available. AC-locomotives (as they are called) offers a better control over the traction motors, this eliminates or reduces wheelslip. This means more tractive effort at low speeds because the friction coefficient is higher. But the price for an AC locomotive is about 1,4 million USD higher than for a DC locomotive. The railroads use these differences. On trains with high speed such as container and intermodal trains the locomotives is normally of DC-type. There is no need for the advantages of AC-traction and certainly no need for the higher cost of the AC-locomotive. On coal trains (= high weight, low speed) only AC-power is used. On such trains the advantages of AC-traction can reduce the number of locomotives needed for hauling til train, and this justifies the higher price pr. locomotive. 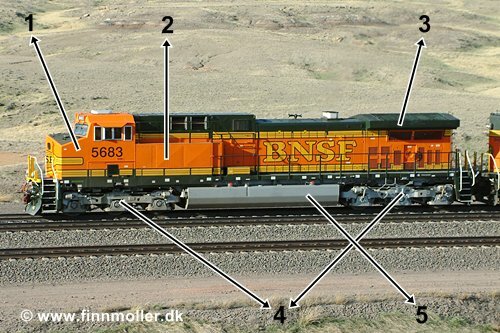 Examples of this can be seen on BNSF - they have a large fleet of GE C44-9W (DC-traction) that is used for many types of trains, including high-priority container and intermodal trains. On coal trains BNSF use EMD SD70MAC, GE AC4000W and GE44AC. 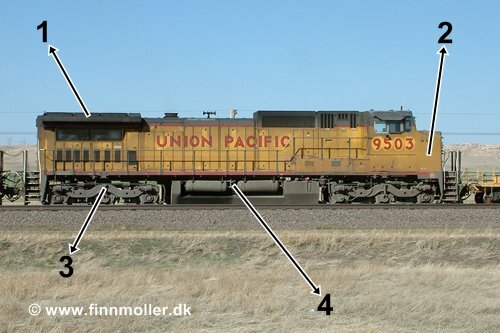 On Union Pacific the same pattern can be seen; the standard locomotives is EMD SD70M (DC-traction), but on coal trains GE AC4000W, GE ES44AC and EMD SD9043 is used. 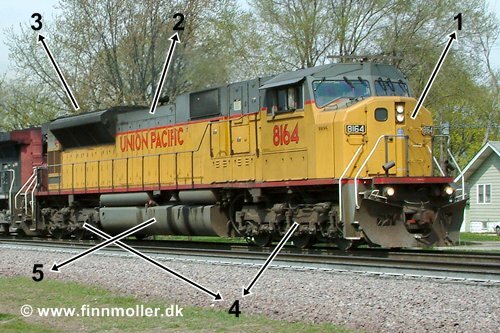 Below is a short description of the different types of trains and rolling stock found on american railroads. Containers are almost always transported in decicated container trains, often combined with trailers on flatcars (TOFC or "piggyback"). 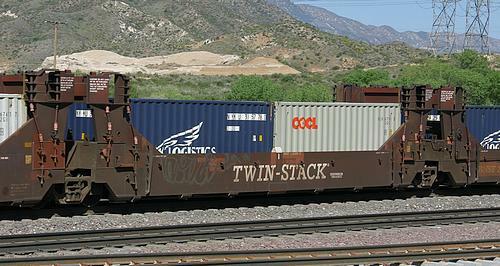 Container trains are often called "stacktrains" og "doublestack" because the containers are stacked on top of each other. 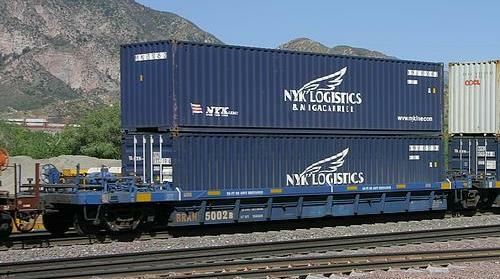 Container trains use special cars like the examples on the pictures. USA has a large import of goods from the Far East, these goods are transported in containers that enter the american continent via container ports like Los Angeles Harbour and Long Beach. From here the containers are transported by rail (and also some on trucks) to the Midwest and Eastern USA. On container trains you will see containers from Mærsk/APM, APL (American President Line), China Shipping, J.B Hunt, OOCL, Evergreen, Hyundai and many more companies. Double stack TTX car 75022. Double stack car BNSF 236095C. Double stack car Brandon Rail 5002. A covered hopper is used for transporting goods that needs protection from wind and weather - this can be corn, cement, plastic pellets etc. Covered hoppers can be found in several different designs but can always be recognized by the discharge gates underneath. 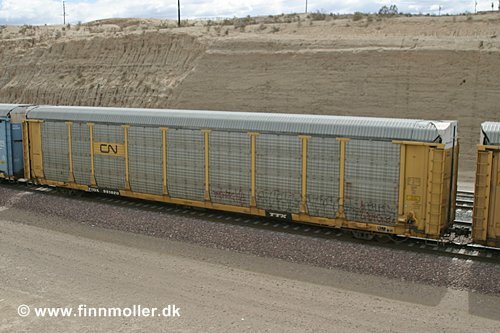 It is very common to see covered hoppers on block trains (trains that only have one type of rolling stock). 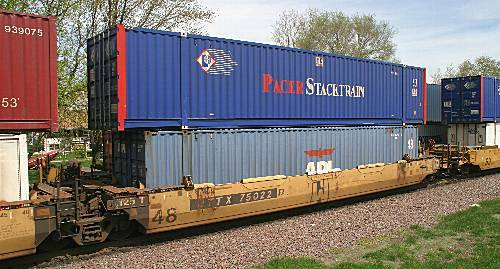 An autorack is a specialized type of boxcar used for transporting cars. This is typically new cars being transported from a production plant or harbour to dealers/distribution centers. They normally have 2 or 3 levels, depending the size of cars being transported. To protect the cars from damage, theft, vandalism etc. modern autoracks are closed. 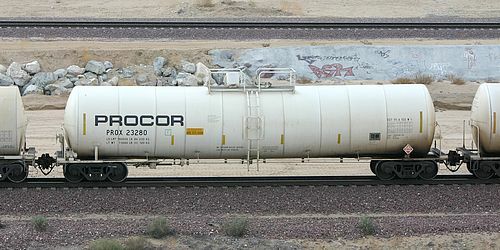 Tank cars are used for transportation of various forms of liquids or gases. Often it is possible to guess what's inside from the inscriptions on the car, but just as often is is not possible to see. 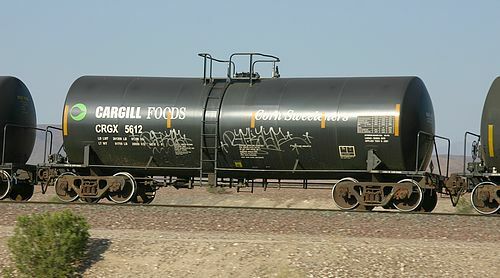 Cargill Foods CRGX 5612 tank car - it is written on the car, that it contains corn sweetener.